Venezuelan leader Nicolas Maduro, who has said the solution to his country’s extreme food shortages is for people to eat less, who said the ghost of his predecessor Hugo Chavez appeared to him as a bird, who claims that Chavez died because a foreign power “inoculated him with cancer,” want to sell you something. If you’re buying, I’ve got a bridge in Manhattan you may be interested in. Just like the days when you could put ‘.com’ on the end of a worthless anything and somebody would invest in it, offer something you call a cyptocurrency, and somebody will invest in it. An encouraging response to Petro has motivated the government to raise another cryptocurrency based on gold. 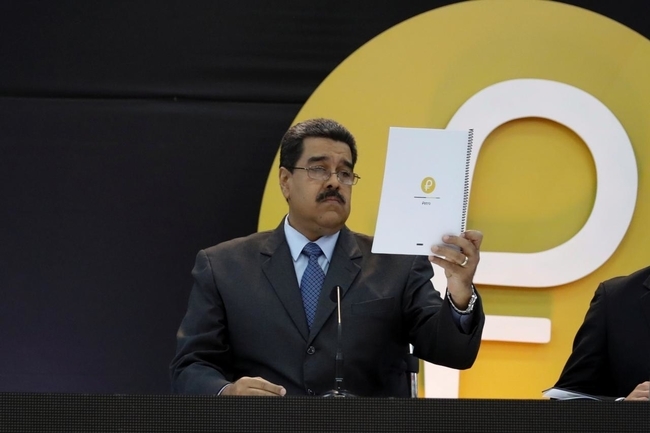 "Next week I'm going to launch the Petro Gold, backed by gold, which is even more powerful, that will strengthen the Petro," Maduro said in a televised speech. But blockchain experts have broadly panned Venezuela's cryptocurrency efforts, noting that digital tokens are only as valuable as the faith inspired by their issuer. Sean Walsh, the founder of crypto-asset investment firm Redwood City Ventures, said it was difficult to draw conclusions about the Petro Gold without seeing specific details. But he said he had little interest in tokens backed by physical assets.